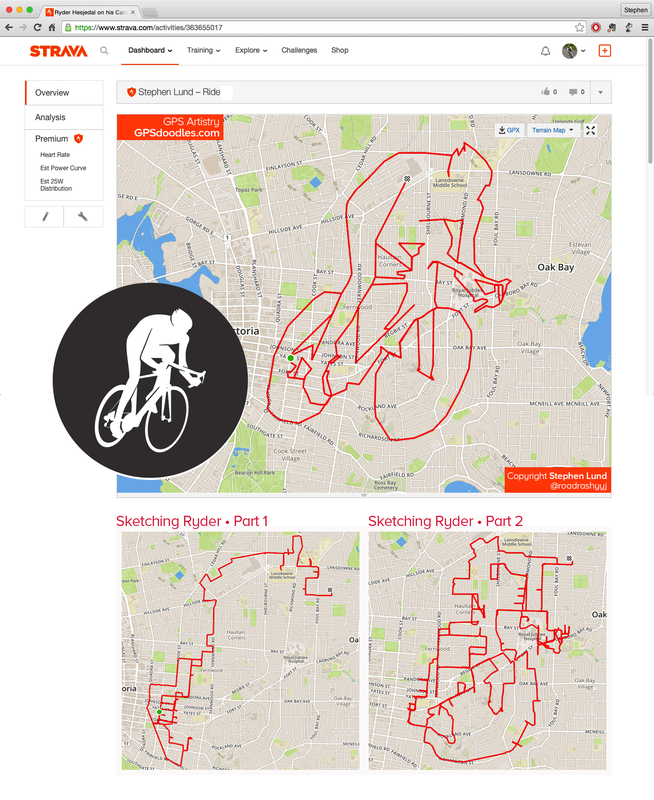 When it comes to GPS doodling, anything’s possible! I used my Cannondale and my Garmin to doodle this depiction of Team Cannondale-Garmin’s Ryder Hesjedal (the Tour de Victoria’s logo graphic). But then I remembered what I usually say when people ask if there are limits to what a GPS doodler can do. I say, “When it comes to GPS doodling, anything’s possible.” And here’s proof! Ryder Hesjedal rides for Team Cannondale-Garmin and spends the off-season in Victoria, BC (his hometown). Coincidentally, I created this GPS doodle on my Cannondale using a Garmin, and I too spend the off-season in Victoria, BC! I’ll be participating in the 2015 Tour de Victoria on August 23. Perhaps I’ll see you there! This entry was posted in gps art and tagged bicycling, Cannondale, Cannondale-Garmin, creativity, cycling, garmin, gps, gps art, Gran Fondo, logo, Ryder Hesjedal, strava, strava art, Tour de Victoria, victoria bc. Bookmark the permalink. Thanks, Jesska. I’m really pleased with how it turned out. Which sort do you prefer to do? I’m with you. While a lot of work goes into planning and executing doodles like this one, there’s something a little more satisfying about the ones where I just ride from beginning to end! Yes, Jean – that’s the beauty of it. The rides are a ton of fun, and I’m fitter than I’ve ever been! You and I are on same wavelength: cycling inspires artistry and vice versa. I blogged about this..